A Banksy painting is back on display 10 years after the artist's wildly popular exhibition at Bristol Museum. 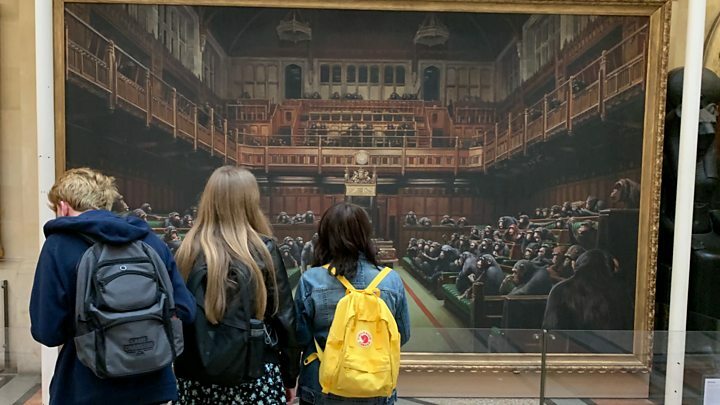 Devolved Parliament, his biggest known work on canvas, depicts politicians in the House of Commons as chimpanzees. It will be on display until September as part of the 10th anniversary celebrations of the Banksy vs Bristol Museum exhibition and is on loan from a private collection. Museum trustee Yoma Smith said: "It was great then and it's great now." The painting was part of the free show that also included an animatronics police officer, fishfingers in a goldfish bowl and a caged chimpanzee painting an idyllic island beach scene. Ms Smith, a member of the Bristol Museum development trust, said: "From the trust's point of view, great art raises a mirror to what's relevant, it may not be that obvious to society. "Ten years on, it's so much more relevant now than as it was then. Is Banksy a visionary? Did he paint it thinking it would happen?" Speaking at the time of the exhibition, for which people queued for hours, Banksy said: "This show is my vision of the future, to which many people will say 'you should have gone to Specsavers'." The 2009 exhibition ran from June for 12 weeks and attracted about 300,000 people. Although the show was free, visitors donated £45,000. In 2015, Banksy transformed the derelict Tropicana lido in Weston-super-Mare into dystopian theme park, Dismaland. That show welcomed some 4,500 paying art fans, and North Somerset Council estimated it brought in £20m to the local economy.